When I started reading TIED IN, it was with a sense of glee. The book seemed aimed at me. Which it was in a sense. You see, I’ve been a tie-in collector since I was old enough to work and buy my own books. Didn’t know they were tie-ins of course, as the term wasn’t in vogue then, if it was around at all. I started with the Man From U.N.C.L.E. novels as it was my favorite mid-teens show. My favorite chapter of the book was David Spencer’s chapter on tie-ins from the fifties through the seventies. I think I have everyone mentioned and then some. William Johnston is mentioned prominently and I have books from him as part of my collection: from Get Smart to The Flying Nun to The Mod Squad to Happy Days to Welcome Back, Kotter. Another favorite was Michael Avallone. Mannix, Hawaii Five-O, The Felony Squad, even(blush) The Partridge Family. I didn’t like the show, but bought all the series because he wrote some of them. The whole book could be considered a primer for would-be tie-in writers, giving the does and don’ts of that particular genre. 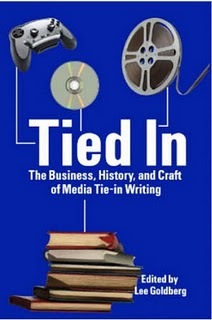 A lot of it I knew, but there was also a wealth of information from various writers on how to get into writing tie-ins. I was particularly fascinated by the early section where writers discussed their methodology in writing them. A lot of similarities there, but also widely different ways to get to the same destination: a novel that satisfies all parties involved. The studio, the licensee, the writer, and everyone within each of those three. All that before a fan/reader ever lays a hand on the book. A fun book for me to read, taking me back to that long ago youth, and a whole lot of information on the business of tie-in writing, putting a lie to the notion(one I never believed anyway) that they aren’t worthy books for a REAL writer! Worth a look whether one has aspirations to write tie-ins or not.